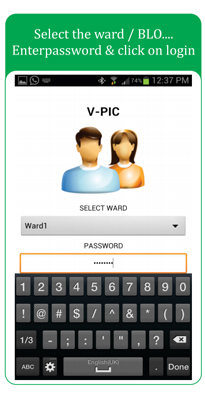 Android based Software which works on smartphones& tabs for taking photos of the voters who’sphotographs are not available in Voter List using Residual Voter List. This will help to establish a process for providing voters with an option to submit his photograph during polling process. Collection/updating of voter information by ECI is a vastexercise, which is performed through its Chief Electoral Officers (CEO) network across the country and is practically a very difficult and expensive affair. The current election commission database has significant percentage of Voters with missing photographs; many times photo collection drives have been unsuccessful. The Solution is to take photograph of the voter at the time of municipal elections at polling booths using this smartphone based software & automatically generates form 8 using the existing database which can be printed using WIFI printer. As elections definitely provide great opportunity to gather mass of voters at one place and on a single day, increased coverage as elections typically get 60-80 % turn out.